Are you this person? Then take a moment to read on. Exercising regularly with regular studies can improve your chances of cracking entrance exams by leaps and bounds. You need to remain alert in order to grasp concepts faster and exercising gives your healthy mind and body that remains alert all day. It is a known fact that with regular breathing exercise and yoga you can manage your day with less sleep. This routine starts with warming up all your joints and muscles (starting from neck, shoulders, wrists, waist, knees, feet). It takes about 7-10 minutes. a great way to start your practice. Sitting cross-legged on the floor, bring your hands into prayer position. Try to quiet your mind, focusing instead on inhaling and exhaling deeply while keeping your spine nice and straight. 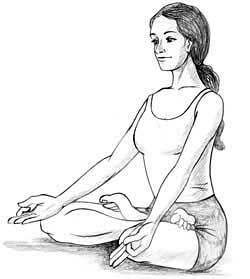 This is the simple padmasana pose. Sit with your legs crossed and back straight. Place the tips of your thumb and index finger together and keep your hands on the knee; try to meditate. Inhale and exhale deeply. It will restore the natural balance between the mind and body along with soothing the nervous system. It will bring a single-pointed direction in your thinking. 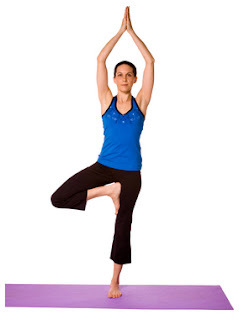 Balance poses are excellent for concentration! You can do tree stand in a number of ways, but to start stand up straight with your hip distance apart. Bend your right knee and grab hold of your right knee with both hands. Once you feel like you have your balance, move your grasp so you’re holding your right foot, and slowly place that foot on your left thigh with the toes pointed toward the floor. Move your hands into prayer, and breathe here for about 30 seconds. A seated forward bend position is a great yoga position for concentration. Just sit down with your legs stretched in front of you and a straight back. Stretch you hands above your head and exhale. Now bend forward and touch your feet. Hold this position and breathe for 20-30 seconds. Come back to your seated position after this and relax. 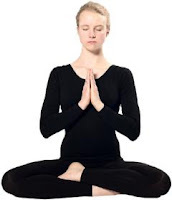 Alternate Nostril Breathing - Sit cross legged and hold your right nostril with a finger. Inhale and exhale through the other one. Now release your finger and repeat the same activity with the left nostril. Do it for 5-6 minutes regularly as it is a great yoga position for concentration that clears your mind and helps you to concentrate. 1. You can go for a 20 minutes brisk walk followed by the breathing exercise mentioned above. 3. Once in a while you can turn to dancing, playing soccer or any good aerobic exercise. This is so true Yogita, Yoga and exercises helps building concentration in mind and you'll be able to keep your mind fresh and attentive towards your studies or any other work. Meditation is best example, "Just close your eyes for while and clear your mind, let the invisible energy come into your brain and you'll feel good, relaxed." these were the lines of my trainer when i was facing lost concentration in my studies. This really works. Thanks for sharing this great post, people need to start working on it.